AusRAIL Plus 2017 will take place on 21-23 November 2017 at the Brisbane Exhibition and Convention Centre. Vulcanite will be exhibiting at Stand 129, so come along and say hello. On October 9-11, Vulcanite will be exhibiting at the American Public Transportation Association (APTA) Expo in Atlanta, Georgia. Come down to our stand and say hello. Ausrail Plus 2015 will take place on 24-26 November 2015 at the Melbourne Convention and Exhibition Centre. Vulcanite will be displaying at Stand 641, so come along and say hello. 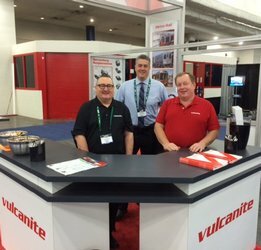 From October 13-15, Vulcanite were at the American Public Transportation Association (APTA) Expo in Houston, Texas. The show was a huge success and gave us the opportunity to catch up with many of our North American customers.